In all honesty, I've come to dread the final installment of all book series that I love, and it's mainly for two reasons. One, simply because the series is wrapping up, and coming to an end. It's so difficult to say goodbye to a series that has been a part of your life for a few years a least, and while I've always looked forward to finding out how the story will finish, I hate the feeling of realizing that I will never read about this particular world, and its characters, ever again. Second, I hate to say this, but over the past two years, I've encountered so many series with terrible endings - endings so jaw-droppingly horrible that I can't help but wish that I've never invested in these books in the first place. Now, I bet you guys can just imagine my trepidation when I cracked open Wings. I was chanting "please be an awesome book, please be an awesome book" in my head so many times while I tried to find a comfortable position to read! And... it was. It really was. Now that I've finished reading Wings, and thus effectively ending my part in Ash and Natalie's tumultuous journey to secure peace for everyone, I feel a bit... broken. A part of me still can't believe that everything's over. I loved the ending, don't get me wrong, but this book was so difficult to get through, simply because the two main characters have been through so much! I'm amazed at how strong and how focused in their goals both Ash and Natalie are. Throughout the series, they've faced so many obstacles, but the concept of giving up never even crossed their minds. Their incessant determination is just astounding! I also can't help but marvel at just how much both Ash and Natalie grew as characters, and I have to laud Richards for making them relateable. While yes, they were trying to save the world, but that doesn't excuse them from your average, same old problems that every single person faces. We have them encountering filial-related problems; of course, a little jealousy here and there couldn't be avoided as well, and despite everything they have accomplished, they were also times wherein they let their insecurities get the best of themselves. While not necessarily main plot devices, it was so refreshing to find characters in dystopians facing the same problems that I do, and ultimately being characters that I can actually see myself in. Richards outdid herself with the plot and story of Wings. While a majority of the book dealt with the rebellion deciding on how best to take down Purian Rose (and this means a lot of talking and confrontations), everything was still paced properly in the sense that I never felt bored while reading it. 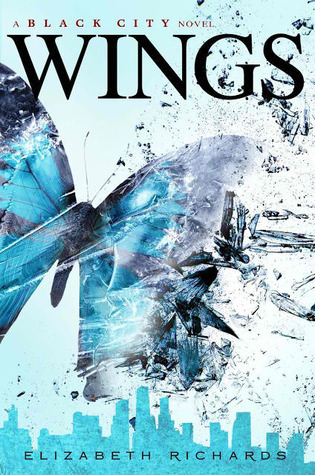 I've come to find that the last books of dystopian series tend to be a bit on the boring side, simply because it deals with politics and rebellions, but I'm happy to note that Wings goes on a different path entirely. Wings is jam-packed with action scenes, beautiful moments wherein you can't even think of denying Ash and Natalie's love for each other, and mind-boggling revelations. Just when you thought that you knew all the characters, their backgrounds, and you knew what to expect of them, you learn the hard way that you never did after all. (And let me stop myself here because if not I will end up spewing out spoilers!) Books that keep me on my toes have a special place in my heart, and suffice to say that Wings is one of those books! There is one particular scene in the book that had me screeching like a banshee, and that had me screaming "Why Elizabeth, Why!? ", and ultimately this is the scene that made me decide to give Wings five stars instead of four. It's also the scene that stuck with me, simply because I did not question just why a character decided to do what he or she (check me out - I'm trying my hardest to avoid giving out spoilers!) did. This character's decision made sense, and it fit with how Richards developed said character. This scene was also highly emotional, and because it happened in a part of the book where you didn't think it could possibly occur at, the element of surprise will definitely envelope you when you read it. All in all, I don't think I have any words to explain just how much I loved Wings, and how much I enjoyed the Black City trilogy. Most of my fellow bloggers as well as my blog's readers are most probably aware of just how much I tend to side-eye and ignore dystopian novels, but I'm really glad I gave Black City a shot. Thank you so much to Elizabeth Richards for these characters whom I will remember forever, and for writing a beautiful trilogy that has ultimately had me wanting to read dystopia again!